Inventing the Opera House: Theatre Architecture in Renaissance and Baroque Italy by Eugene J. Johnson is a scholarly but readable account of the prehistory and early history of the form we know today as an “opera house”. It’s fair to say that the road to the horseshoe shaped auditorium with ground floor seating and tiers of boxes looking over an orchestra pit to a deep stage was far from straightforward, perhaps even tortuous, and Professor Johnson lays out that journey in some detail. Johnson begins around 1480 in the ducal courts of Northern Italy. At this point no purpose built theatre had existed since classical antiquity. Despite that, princes competed in the magnificence of the “spectacles” they put on for events such as dynastic marriages (partly driven by the fact that many of the houses; Medici for example, were trying to obscure their rather recent origins by leveraging their great wealth into marriages with more distinguished lineages). It was also, of course, a period of revived interest in all things Greek and Roman, including the theatre, and there was prestige in putting on a Roman, or Roman derived, comedy for example. But how to stage it? The theatres of antiquity had been open air structures built on a semi circular plan but 15th century Italian architecture was rectilinear and the preferred time of year for festivities, winter, precluded an open air setting. The current Tapestry Briefs show presents work from the 2016 LibLab. It’s all new and, inevitably, very mixed. It started very strongly with a scene, The Call of the Light (Imam Habibi/Bobby Theodore) based on the 1984 attack on the Quebec National Assembly. The combination of an assault rifle carrying camo clad Alex Dobson , the rest of the cast (Jacquie Woodley, Keith Klassen, Erica Iris) writhing on the floor and dissonant extended piano from Michael Shannon was genuinely disturbing. Having a gun pointed straight at you from a few feet away doesn’t happen often at the opera. Yesterday’s free concert in the RBA featured mezzo Marion Newman with pianist Adam Sherkin and violinist Kathleen Kajioka in a programme of contemporary Canadian works (all the composers were in the room!) mostly connected in some way with Canada’s First Nations and Inuit peoples. First up was Ian Cusson’s setting of E. Pauline Johnson‘s A Cry from an Indian Wife. It’s a long, highly emotional but not, I think, especially well crafted, text about an Indian woman sending her husband off to war (the language reflects the usage of its day) and the words are not easy to set or sing. Cusson’s setting is appropriately intense with a blistering piano part and a tough vocal line. It’s deeply affecting but hardly comfortable especially when sung in a manner that clearly (and rightly) privileged text and emotion over beauty of sound. 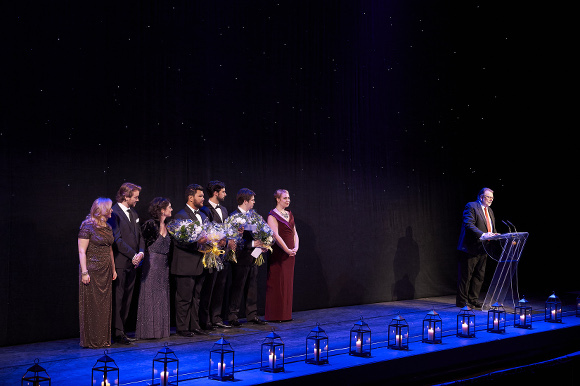 So we now know who will be singing at Centre Stage, the COC’s gala competition for aspiring young singers with both cash prizes and places in the Ensemble Studio up for grabs. There are, I think, only two that I’m at all familiar with; soprano Eliza Johnson who was a finalist last year and baritone Zachary Read who was a rather good Sid in UoT Opera’s Albert Herring a couple of years ago. 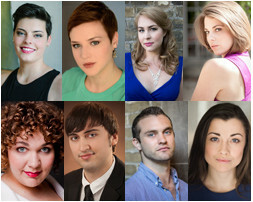 The other six are mezzo-sopranos Emily D’Angelo, Lauren Eberwein, Marjorie Maltais and Pascale Spinney, soprano Samantha Pickett and baritone Bruno Roy. Wow! Four mezzos so the mezzo mafia will likely be ecstatic. No tenors but with four already in the Ensemble Studio that’s probably a good thing. Centre Stage is on November 3rd at 5.30pm at the Four Seasons Centre with a cocktails (well wine mostly) and rather good snacks before the competition itself. Tickets are $100 from the COC box office or coc.ca. Last night saw the second annual Centre Stage at the COC. It’s described as the “Ensemble Studio competition gala”, which is pretty much what it has become. It’s a dressy occasion and busier this year than last. Bussing in the claque from the University of Toronto upped both the noise level and the “beautiful young people” content. The competition itself is fairly conventional in that all the singers get to sing two arias of their choice. What’s a little different is that the accompaniment is the full COC Orchestra and as well as the jury prizes there’s an audience choice award facilitated by some neat electronics. Then of course there’s always the issue of a place in next year’s Ensemble Studio.